Located in the homonymous street, close to Piazza Garibaldi, the Roman Amphitheatre was a great space for the gladiatorial games. it was built in the early years of the Roman Empire and still retains an auditorium with a diameter of 70 meters in an ambulatory hand resting on a semicircular shape, covered by a barrel vault, from which you could access through three entrances to the seating . From the end of the auditorium was reached instead for the posts reserved for judges and prominent citizens. The orchestra keeps the paving slabs of colored marble, and on the stage you can see the holes for the poles of the curtain. The external facade was made up of arches framed by half-columns of the Tuscan order. The remains of the original work are still visible enough to show that around the structure there was a double row of overlapping arches, perhaps with the attic, and that the drywall was probably covered with a facing stone. >> Do you want to visit the Roman Amphitheatre? Contact now the best farmhouse in Spoleto and discover their offers! 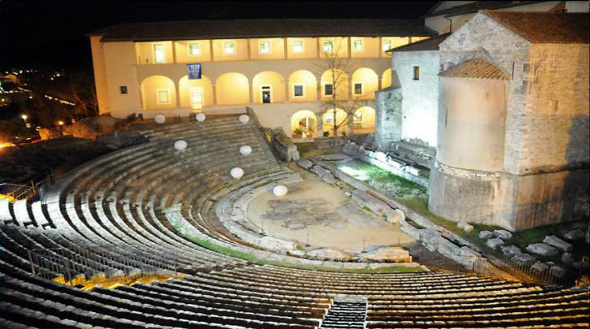 The amphitheater of Spoleto is a case of continuity of the life of an old building, documented by various modifications to adapt it to new and different functions to be progressively dismantled for the construction of the fortress Albornoz, who reuse most of the materials of coating of the arena. >> There are offers in deadline! Click and consult list of the best hotels in Spoleto! Much of the amphitheater, like the parts of the ambulatory and one of the entrances to the lower tiers, is now incorporated in the urban sector which constitutes a unique body building belonging to the barracks Severo Minervio. 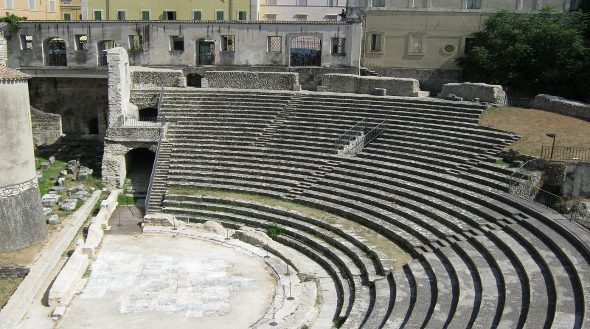 The structure of the Roman amphitheater now hosts concerts, ballets and other cultural events.